Keeping in mind that I played this course nine months ago, I’m writing a review about North Watertower Park in Sarasota, FL. Why bother you ask? For a course I actually only played 36 holes on? The reason is is complicated: I keep thinking about it. Is there any elevation change? No. Are there a ton of par 4’s? No. Then what’s the big deal? I spent a week in Florida last winter and picked out 6 courses to sample, and this course was the most fun. It may have been because there were plenty of local folks buzzing around, playing through, and playing with me for those few hours. It may have also been the 70+ degree weather and sunshine (with me being from Massachusetts and my driveway completely iced over at the time). These are variables I’d keep out of the equation if this were really an objective review. Luckily it’s not an objective review. The little things that you can take for granted at your home course are the ones that made me appreciate this course. For example, the first hole is very easy to find. Once you park your car in the parking lot, a simple glance toward the porta potty reveals the first tee pad (made of cement by the way). And as I just mentioned, there’s a porta potty. The course is in a park which borders a neighborhood. On Dgcoursereviews.com there are mentions that it isn’t a great neighborhood, however I encountered no trouble. I’m not sure what I was expecting? A group of unruley teens walking all over the course grabbing discs and running away? Not quite. There is a field area near the parking lot which contains all the longer shots. The layout plays from the field, to the woods/trees and back out a few times. It’s a logical flow that doesn’t leave you searching for tee pads or holes. Towards the back of the woods area, there are a few holes that play near a stream that can be deep enough in places to swallow a disc for good, but they are far from white water rapids. Either way it’s always a good thing to have to play around water and have a healthy fear of losing a disc once or twice per round. I can’t remember my scores, but I can distinctly remember a number of holes where I finally learned to keep my drives level and low. There are so few holes in the Florida trees that allow for much more than 10 to 15 feet of elevation on your drive. There were also a healthy mix of hyzer and anhyzer shots off the tee pads at this course. Hole 17 was a nice challenge. Being a par 3, but heavily wooded and 300 feet, it had my number the first time through, and a got a double bogey 5. I don’t have the distance on the anhyzer shot, nor the accuracy. So the second time through I hit a needle thin gap on the right for a hyzer shot that essentially traveled through trees the entire flight and parked it… I wish I could add the words “ON PURPOSE” to this section, so I’ll just stop typing instead. 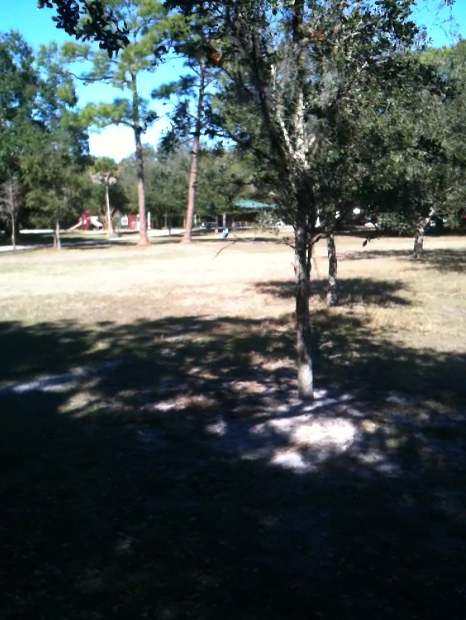 This entry was posted in Course Highlights and tagged course, disc, golf, north, park, review, tower, water, watertower. Bookmark the permalink.